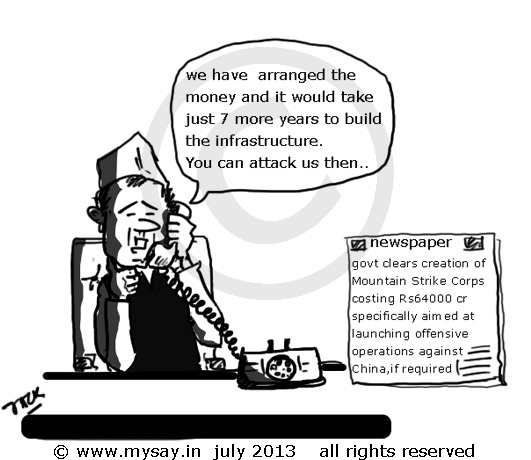 Long term plans of the Govt on how they are going to fill their pockets..
Great cartoon and thought as always. But, my question is something else. Aren’t we getting a little too paranoid about the Chinese flexing their muscles? If you look at the case of China, you’d understand that flexing muscles is all that they have been doing at their neighbours. Taiwan, PRC, Japan, Vietnam and India… the war in 62 was a bad case and blot in the history of Indian warfare. There’s something called the Chola Incident hich happened in 1966, I think. Chinese army infiltrated Sikkim, which wasn’t a state in the Indian Union at that time.. The Indian army kicked back well and the skirmish ended in resulting heavy casualty on the Chinese side. No one mentions this incident anywhere and I know about it from my grandfather who happened to face the intruding Chinese in Sikkim. It is also notable that inspite of having a numerical advantage over the defending Indian soldiers, Chinese Army could not advance or withdraw from the battle field. My grandpa used to say that they were choked from all sides. It is true that infrastructure development on the Indian side of the border happens slowly but the Chinese border on the Indian side are not exactly Chinese, are they? They are all buffer states which have different sorts of problems with the Chinese government… In a crucial situation they wouldn’t want to fight with India without resolving issues with the local fiefdoms. The real picture of north east India is a little different and is never hyped in Media … there are several kilometers where Chinese have penetrated .. Sikkim indeed was self dependent at that point of time but the 7 sister states have been dependent on India since ages .. and the governance out there is like any other state of India.. Chinese are playing bad games .. promoting terrorism .. although lot has been curbed thanks to the corrupt philosophy of India.. they lure the terrorists with money and keep them in check or use them for vested interest.. important it is to let them know WE ARE !! thats what I feel ! What Say bro ? It is true that countries promote terrorism in enemy countires because that’s one of the few strategies for weakening the enemy preparations. This mountain corps thing goes way back. Indian Army should be able to deploy itself faster on the LAC. But, I’m of the opinion that we have learned lessons from 62 because that has never happened to us after that. PS. : Sorry, it got longer than I thought it would be,. Whenever I read about India’s relationship with neighboring countries, I can’t think beyond anger and depression. I am not sure if we are ever going to find solution to this situation. My dad was in Navy Defense. He always used to say that what they used to win in battles, government gave it back on the negotiation table. We have a tendency to look the other way when it comes to dealing with the Chinese. Despite having the might of a nation equipped with a vast army of intrepid soldiers, we have neglected the task as far as infrastructural facilities are concerned. The post is all about the sad reality we have to face. and my question is why do we take threats Sir ? When we can counter answer Pakistan why is our govt not giving a stringent look to the Chinese .. after all they are the ones who are more dependent on us when it comes to trade .. if the govt wants they can simply increase the taxes on Chinese products .. the moment their sales go down from India their shaky economy will be effected ! !